Has the S&P 500 Index Broken Out Yet? 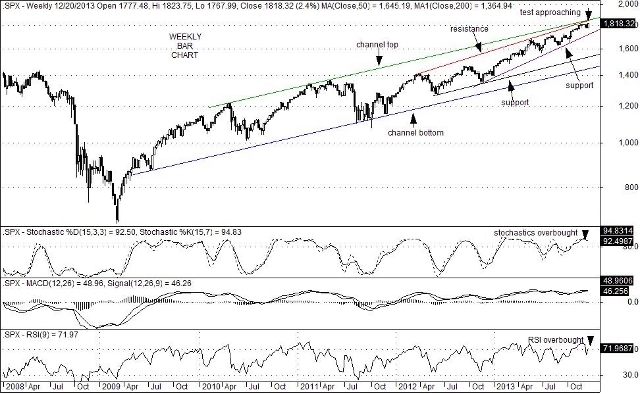 While it is true that the S&P 500 Index has hit new all-time highs for each of the past six (6) weeks, the S&P 500 Index (SPX) has not yet broken above key “channel top” resistance. And while the bullish trend remains in place with the SPX rising “from the lower left to upper right” on weekly charts, the pace of the upward movement has been limited by “channel top” resistance (currently at 1,843). Some observers suggest that Fed stimulus will remain in place for quite a while despite the beginning of the tapering effort starting in January. Nevertheless, a number of well-known investment professionals also suggest that upside price activity will likely be limited to a range of 4% to 10% in 2014 following this year’s stunning gains. Others warn (or perhaps pray) that a 10% to 15% market correction is long overdue. Fundamental positives include: lots of idle cash on the sidelines; the likelihood of further corporate stock buy-backs schemes and dividend increases; further job gains; the beginning of increased capital expenditures; further strides toward energy independence; more household formations followed by a rise in home building; diminished political dysfunction in the U.S.; and of course, near-zero percent short-term interest rates with lots of liquidity provided for some time to come (don’t fight the Fed!). The negative side of the ledger sheet includes: the negative impact of Obama-care to many individuals; growing wage disparities muting consumer spending; worries that economic conditions in Europe will not improve; growing political tensions and saber-rattling between a number of Asian countries; rising concerns over the disinflation/deflation debate keeping idle cash on the sidelines in a capital preservation effort; continued debt deleveraging limiting economic expansion; and the possibility of profit margins getting squeezed. 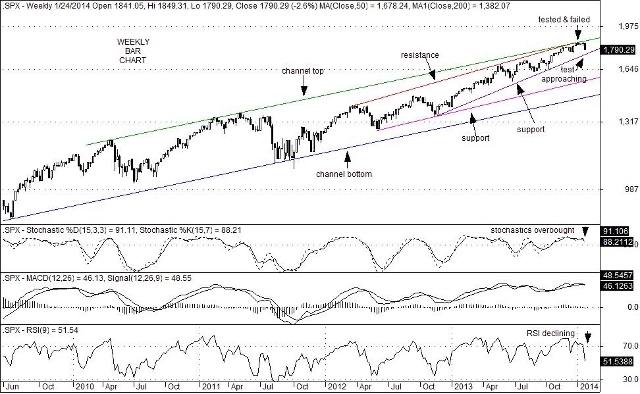 From a technical point-of-view a break above “channel top” resistance currently at 1,843 would be an impressive bullish surprise if it occurred, particularly with of persistent overbought conditions present. A failure to break higher, on the hand, could give way to a pullback with the initial target sitting at 1,724. That being said, a pullback to 1,724 would represent only a modest 4.7% correction. A break below 1,724, on the other hand, would likely increase the chance that a move down toward trend line support currently sitting at 1,554 (or a 14.5% decline) could occur instead. For now however, the S&P 500 remains with a bullish bias. You are currently browsing the archives for the The S&P 500 Index (SPX) category.